As a reward for finishing the hose, I bought a pattern - <a href="http://www.ravelry.com/patterns/library/theseus-and-the-minotaur>Thesus and the Minotaur</a> I need to dye up the yarn for it....but they are COOL. (I like socks with themes.....these? I'll wear when we study Greek myths/architecture next year. Or wear to the Art Museum. Whatever.....:lol:) Yesterday was take the aunt shopping day, and call the IRS day. :sigh: I was on HOLD for 2.5 hours....talked to *2* agents, and got told that I needed to call back to talk to the 1st department AGAIN. They have NO idea why the refund hasn't hit, why there is a problem....I think they were hacked. Seriously. I've tried 18 times this AM to get thru; I got thru at 7:45, and my phone DROPPED THE CALL :bangs head: Frustration isn't even.....:arrrrrrrrrgh: Himself has requested a.....different type of History for next year. We're finishing up Modern World History; normally we'd cycle back to Ancients and go thru it again. He wants to do something on Historical Architecture. I've found a bunch of documentaries that fit, and The Teaching Company has some courses, so I'm going to try and set something up. Sounds fun! More later - I really need to keep hitting the IRS line. :sigh: <b>ETA:</b>. The Yaacov socks have been sent to the frog pond. The yarn is a singles, which will NOT last very long. Not on my feet, anyway. 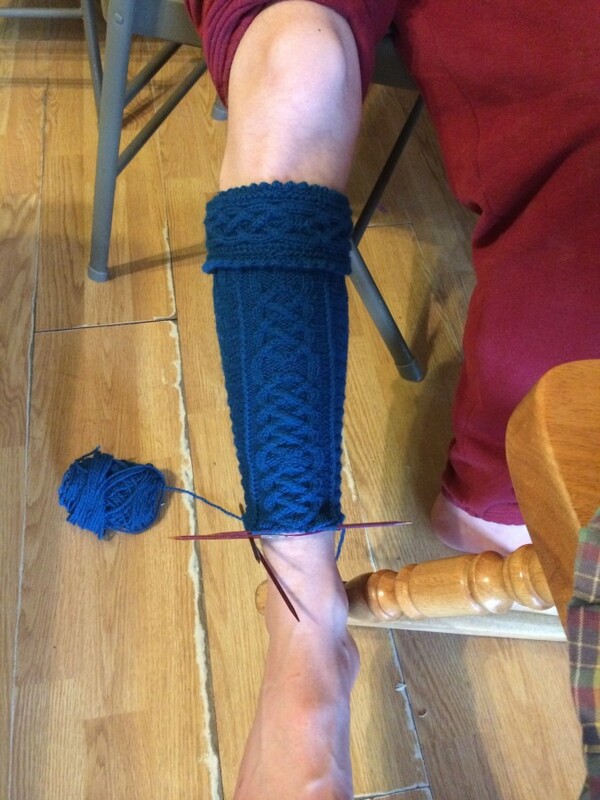 :sigh: I've ordered a sock blank so I can dye my own, and will start them again once that's done. with Skutt's Customer Service. Daniel *called* me (he had to look up my number, because I sure didn't send it to him!) to talk about the kiln. Unfortunately, it's going to take more $$$$ than it's worth to get it to a point of *test* firing it. :Sigh: Lesson learned. He went out of his way to give me advice on what to look for. He also very carefully did NOT push for me to buy a Skutt kiln - which is IMPRESSIVE. I have found a few kilns on CraigsList that I am thinking about - I sent links to my potter friend to see what she says. So, in a day or 2 I'll be listing the project kiln back on CL to try and get my $25 back. At least it wasn't an expensive lesson, y'know? (I wish I could just drop the funds to buy her a new kiln, but....it's just not possible. The kiln Daniel recommended has a retail price of $1700 - yes, it's all digital, and it's NEW, but....I just can't do that. Right now my budget is $300, *maybe* $350, so it's gonna have to be used. I am anticipating having to replace elements, even at that price - but if the kiln WORKS without a whole lot of other repairs, it'll be worth it. Oh! We saw Big Hero 6 last week - it's a good movie. VERY good. Go see it if you can! I want to see Imitation Game, too..hopefully soon. Been slogging along on the kilt hose, V.1.2. Finished the cuff yesterday and am now working the ribbed "garter" under said cuff. LOTS of knitting yet to do - but I enjoy it. We're in Leviticus now. LOTS of good, meaty stuff there - all sin isn't equal. Don't believe me? It's right there in Lev. 3-5. Lots to think about, there! We're also studying WWI. We're doing documentaries this week - our History text spent 1 chapter on the war. (Ditto for WWII) So....I'm filling in. I honestly didn't know that Germany had concentration camps in WWI - did you? Today we get "faster" internet...we'll see. I'm not holding my breath - it's the same company, they're just moving us to a "faster" tower. Yeah....we'll see. Almost time to start - laters! H: They keep your entries for *months*???? Wow. Here, the *County* Fair opens for entry drop-off the Friday before the Fair begins; judging of the "Creative Talent" stuff is Sunday and the Fair opens for visits on Wednesday. Saturday you go pick your stuff up. So...1 week, basically. H, again: You gave me a tip about a Dover book on fitting patterns....I haven't found that one yet, but I scored at Half-Price on Wednesday. I got a copy of "Every Sewer's Guide to the Perfect Fit"....Wow. I have quite a few books on this topic, but this one...THIS one is Awesome. The authors assume that the sewer knows the basics and nothing else - and they don't talk down to you. WORTH the $4.99 I paid. :lol: I'm still looking for the Dover book - because one can never have too much knowledge. Ali: LOVE the babies! Especially the Nubians! :wink: We bred very late this year - partly on purpose, partly because December was the first time I could get the buck over next to the does AND the first time I actually caught anyone in heat. Annie snuck over to the bucklings a couple of months earlier - hence the twins. Good news is, we have milk - we were still milking 3, and getting *maybe* 1.5 pints/day. Annie, by herself, is giving us a little more than 1/2 gallon/day. We're currently milking Annie and Zoe, but I'm going to dry up Zoe in the next week or so - she was bred but doesn't look it, but milked thru last year AND gave us a buckling...I'd kinda like to give her a break. I got my copy of Gainford's "Knitting Kilt Hose and Knickerbocker Stockings" today (which means I'll find my original this weekend, right?) - I'm going to start planning SG's pair. The pair I'm knitting for Himself will in NO way fit SG - I'm knitting the Medium for Himself. The Large is the same, but you add 12 stitches to it.....SG's calf is WAY bigger than 1.5" larger than Himself's. 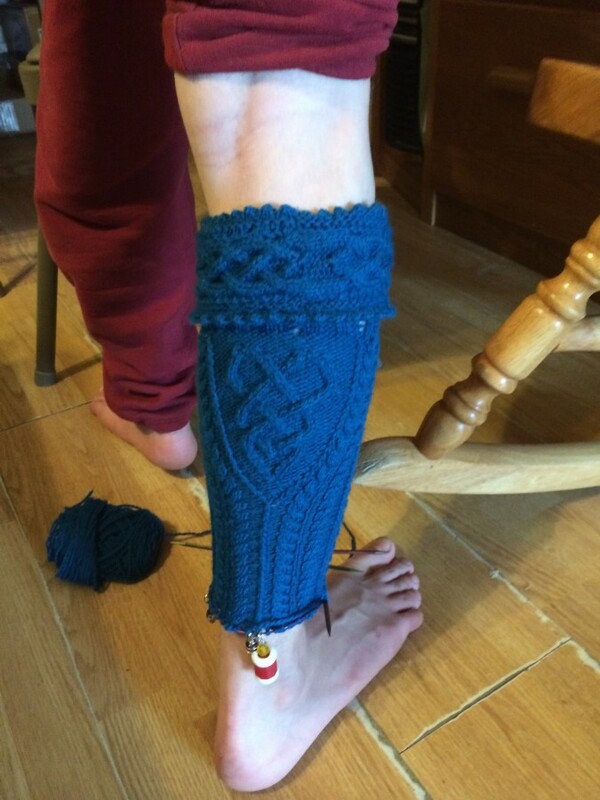 There is just no way I can knit the same pattern and have it fit SG - he's got lovely, manly calves - at least, not without adding at least 2 more cables to it. I'd rather just start fresh, to be honest.